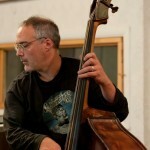 CHRIS LOPES has been playing, writing and recording music for almost three decades. He is adept at straight ahead jazz and free jazz, afro-caribbean, Brazilian, funk, reggae, blues as well as a very wide palette of musical experiences and expressions of all kind. Chris was an original member of Rob Mazurek’s Chicago Jazz Underground and he has been featured on all three of Jeff Parker’s (Tortoise) trio recordings. Chris has been living in San Francisco, where he performs and records in an amazingly wide variety of musical settings; with Scott Amendola (John Zorn, Bill Frisell), Ben Goldberg (Nels Cline), George Brooks (John McLaughlin), Glimpse Trio, John Calloway (John Santos) and latin jazz/Sephardic singer Kat Parra. Most recently, he has been writing for his latin jazz and funk quartet which he co-leads with pianist and composer, Nina Ott. Chris is also putting the finishing touches on his first publication of solo pieces for the electric bass.